Stretton Choral Society, in its present format, was founded in 1977 and currently meets once a week in the newly refurbished United Reformed Church, Church Stretton, between September and May to rehearse for at least two public concerts each year. A concert in December usually consists mainly of music related to the Christmas season and includes some Christmas carols for the audience to join in. A spring concert in early May allows for more substantial works in the classical and modern repertoires. Following the retirement of our previous Musical Director, David Hart, in May 2011, our Musical Director has been Paul Kelly. Paul was already known to the choir as he had been playing trumpet in Ensemble Musicale, the orchestra which comes together to accompany the choir in our concerts. Paul started his conducting career studying with George Hurst at Canford Summer School and later became a private pupil of Ezra Rachlin - a former assistant to Fritz Reiner. While living in Croydon he directed a variety of orchestras, choirs and bands including a lot of opera with COSI - Croydon Opera Singers. After a year studying on a British Council Scholarship at the Liszt Academy in Budapest he returned to the UK to concentrate on education. He then studied part time for a masters in Composition at Goldsmiths College. 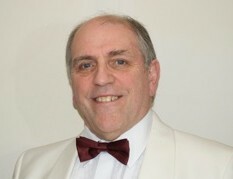 He retired from the post of Director of Music at William Brookes School in Much Wenlock in 2005. Since then he has been Musical Director of the Shifnal Chorale and is currently Musical Director Much Wenlock Male Voice Choir and Church Stretton Choral Society. As director of the Shropshire Chamber Orchestra he has staged a number of concerts throughout the region and has raised funds for a number of charities. Since retiring he has revived his trumpet playing forming Random Brass, an expandable brass quintet providing music for many occasions, and plays in Band On The Edge, a versatile jazz ensemble.